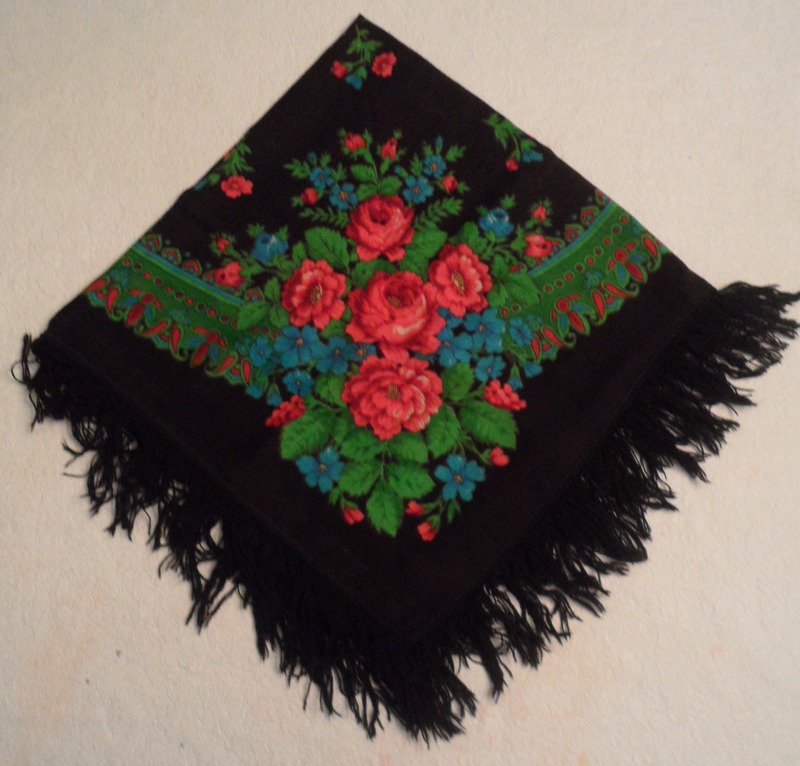 Today’s object is a shawl bought at Sergeev Posad in 1995. To reach this conclusion, Laqueur embarks upon a potted history of Russian politics, and then upon a rather rambling examination of various other subjects including conservative and far right philosophy, demography, post-Soviet attitudes towards Stalin, and Russian foreign policy. The effect is somewhat incoherent, as the text leaps backwards and forwards in time and space and from topic to topic. But an overall theme does emerge, namely that a lot of Russians believe in a lot of really crackpot ideas. In some respects, I agree with this. I share, for instance, Laqueur’s negative appraisal of Eurasianism. The reactionary pronouncements of some high-ranking members of the Russian Orthodox Church are also fair game. And Laqueur’s observation that Russian political culture has a paranoid streak is accurate. There are, however, some weaknesses in his thesis. In the first place, he doesn’t do a very good job of showing that the loopy rantings of far-right philosophers and historians really have an impact on how Russia’s rulers think, let alone prove that they have any impact on their behaviour. 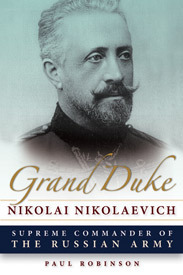 He says, for instance, that the Russian government’s current alleged support for Eurasianism (which I think in any case is much exaggerated) ‘has to do in part with their aversion toward Europe, which (they feel) rejected it, but it is also a reflection of the immense popularity of the ideas of Lev Gumilev’. But are the ideas of Lev Gumilev really ‘immensely popular’? I can’t say that I see any strong evidence for that assertion. Laqueur then goes on to say: ‘Putin and his colleagues believe that the long search for a new doctrine has ended and that in [Ivan] Ilyin they have found the prophet to present their much-needed new ideology’. But is that really so? I have suggested elsewhere that Putin is fond of Ilyin, but it is not clear how many others share his preference, and in any case Ilyin could hardly be said to be the sole source of the modern ‘Russian idea’, even if it could be shown that such a thing exists. It also makes little sense on the one hand to claim that modern Russia is Eurasianist in orientation and on the other hand to say that Ilyin is the country’s prophet, given that Ilyin most definitely was not a supporter of Eurasianism. Laqueur does not appear to like the conservative trend in Russian thinking, and as a result emphasizes its negative side to the detriment of anything positive which might be found in it. One can see this in his treatment of Ilyin, which concentrates almost entirely on the favourable things the philosopher had to say about fascism. But there is more to Ilyin than that. Similarly, while it is true that contemporary Russian politics contains more than its fair share of crazy talk, not all Russian conservatives are loony conspiracy theorists. As Paul Grenier showed in a recent article, ‘anti-Western Eurasianism is part of contemporary Russian conservatism. But it is only one part.’ Russian conservatism, Grenier notes, is very varied, and its adherents contain many intelligent, creative, and in some instances even quite liberal people. It deserves a deeper and if not sympathetic, at least more empathetic, analysis than Laqueur is willing to give it. Grenier comments that, ‘If we wish to understand Russia in something like its true complexity, we have to take the trouble to listen to it, to let it speak in its own voice instead of constantly projecting onto it all our own worst fears.’ Laqueur’s Putinism doesn’t do this. My worry is that rather than deepening its readers’ understanding of Russia, this book will serve only to convince them that Russians really are a bunch of crazies with whom no civilized conversation is possible. Kovpak’s view, and I suspect this is an opinion held by many others, is that only one side may legitimately ask ‘what about?’ The West can point fingers at Russia, because it is objectively better, but Russia has no right to point fingers at the West, because Russia is objectively worse than the West. The comparisons Russian whataboutists make are therefore invalid. However, even if Kovpak is right that the West is objectively better than Russia, it still seems to me to be completely valid to point out hypocrisy where hypocrisy exists. For instance, when people like Michael Weiss of The Interpreter Magazine denounce the Russian media for their bias, it is surely entirely fair to comment, as I have, that Weiss and The Interpreter are hardly bastions of balanced reporting themselves. In addition, Russia isn’t always and in every way worse than the West. Don’t get me wrong here. Quite obviously, Russia is not a properly functioning liberal democracy. It has a serious problem with corruption, and its foreign policy does not always respect international law. Often, when Russians point fingers at Western countries, and argue that things are as bad if not worse over there, they are wrong. But sometimes they are right. When, for instance, people respond to complaints about ‘Russian aggression’ by pointing at American and NATO aggression elsewhere, they are making a fair point. Western commentators often claim that Russia is a ‘revisionist’ power; that in Ukraine it is trying to tear up the existing international order. Whataboutism allows us to see what a ridiculous claim this is, since the people making it are citizens of states which have done more to undermine that order than anybody else, through actions such as the invasion of Iraq and the bombing campaign against Libya. In a recent episode of RT’s Crosstalk show (yes, I know, RT, lackey of the Kremlin, propaganda, lies, blah, blah, blah), Dmitry Babich commented that the real problem in international politics was not whataboutism but ‘let’s move on-ism’. I like this. Take the example of the torture carried out by Americans during the War in Terror. Nobody apart from whistleblowers has been jailed. Why? According to President Obama, because ‘we need to look forward, not back’. Likewise, consider the invasion of Iraq. ‘I know a large part of the public wants to move on’, said former British Prime Minister Tony Blair, ‘I share that point of view.’ And so on. Nobody is ever held to account. In these circumstances, it is a good thing that somebody somewhere is willing to do a bit of finger pointing. Instead of rejecting criticism, we in the West should start taking it a little more seriously. 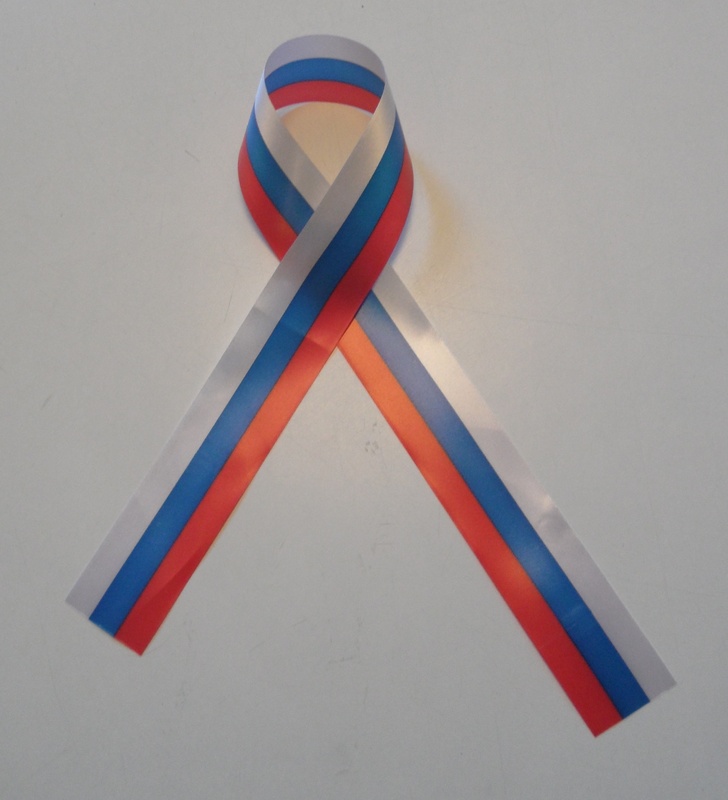 This week’s object is a ribbon in the colours of the Russian national flag which I was given in celebration of Russia’s national holiday last month. At a briefing on July 19, Major General Andriy Taran, the head of the Ukrainian side of the Joint Center for Control and Coordination (JCCC), said separatist forces had driven out of the city to fire upon the center of it before returning and firing on Ukrainian positions as if in retaliation. The shelling was done specifically to be able to accuse Ukrainian forces of breaking the ceasefire and firing on civilians, Taran said. This is, of course, nonsense. Ukrainian artillery has hit residential areas of Donetsk, Lugansk, and other towns time and time again. Large numbers of people have died as a result. The Ukrainian government’s refusal to accept responsibility for this is a serious moral failing on its part. Rebel forces have had less need to engage in such denial, because for most of the war they have had less artillery at their disposal and have been defending urban areas rather than attacking them. Firing out of a city tends to be less damaging than firing into it. But when they have killed civilians, the rebels have been equally unwilling to admit it. An example was the shelling of a bus in Volnovakha on 13 January 2015, which resulted in the deaths of 12 people. Given that the bus was well behind Ukrainian lines, rebel artillery was almost certainly responsible, but rebel leaders have never admitted this. Nor has anybody ever confessed to the shooting down of Malaysian Airlines flight MH-17 in July 2014. The inclination to avoid responsibility is widespread and understandable. What is perhaps surprising is the willingness of outsiders to let people get away with it. Neither Russia nor the West have shown any notable inclination to force their proxies to be more honest. Rather they seem to encourage the tendency to claim that others are at fault. It seems that the desire to maintain an ally’s image outweighs the desire for the truth. On Friday I participated in a ‘Tele-bridge’ which was broadcast by the online Ukrainian TV station, Channel 17. The idea was to promote dialogue between the warring parties in Ukraine by bringing together via Skype representatives of both sides along with outside commentators who could provide an alternative perspective. The ‘Tele-bridge’ participants included military personnel and civilians in Kiev (including a member of the Right Sector organization), representatives of the rebel Donetsk People’s Republic, a journalist from Minsk (Aleksandr Feduta), and from Ottawa, the former Canadian ambassador to Yugoslavia James Bissett, Halyna Mokrushyna who is a PhD student at the University of Ottawa, and me. Details of the Tele-bridge can be found on the website of Channel 17 here. An abridged version containing only those parts in which the Canadian contingent participated is online here. I apologise for at one point continuing talking when the interviewer was trying to let somebody else have a word – the sound link with Kiev was poor, and I couldn’t hear what was being said. 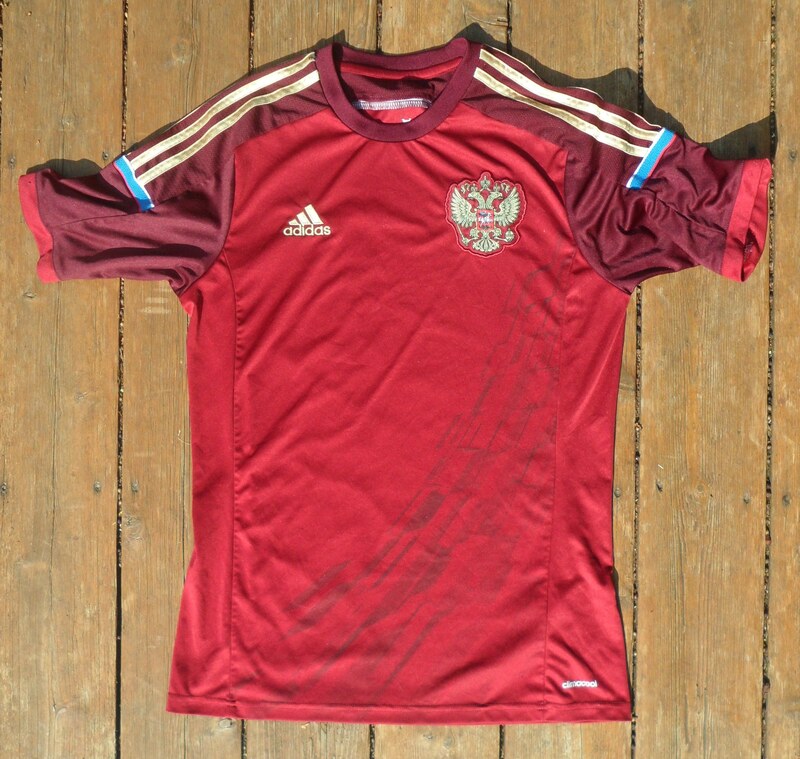 Canada recently finished hosting the Women’s World Cup, so here is a Russia soccer (football) jersey.